Since working on the Dangerous Prototypes version of the XT/IDE project, I’ve been increasingly interested in ‘the storage problem’ for early 1980’s PCs – it’s both difficult to transfer files between machines and increasingly problematic storing data on them too, with still surviving hard drives now well into borrowed time. My first attempt (the XT-CF board) was too limited to justify the assembly effort, and my second attempt (the XT-CFv2 board) pushed the 3.3V CPLD too far so suffering reliability issues. Next I created the simpler XT-CF-lite, which Sergey has taken on and improved with his re-spin, using mostly through-hole components. At the heart of the XT-CFv3 is the Xilinx XC9536 CPLD. To me, these are little pieces of silicon magic – simply hook up the components on the PCB to the nearest convenient CPLD pin, then define in software the circuit logic the CPLD should perform and upload it into the CPLD. This is great for home-brew projects like this, since once the basic PCB layout is done and the board electrically sound, the design can be revised over-and-over by just reprogramming the CPLD. DMA is the big XT-CFv3 feature: it offers performance way beyond what any disk controller ‘back in the day’ could do, achieving up to 530KB/s on a stock PC/XT. The CPLD implementation makes this possible since it can do the work of many discrete logic chips (and of course be reprogrammed in the development phase getting it running). More on this, and the other operating modes, to follow soon. The XT-CFv3 is just entering field testing so is some way off still. The plan though is to offer bare PCBs and brackets for home assembly. In the mean time, Sergey has done a great job with his version of the XT-CF-lite, making it mostly through-hole so a little easier to make. 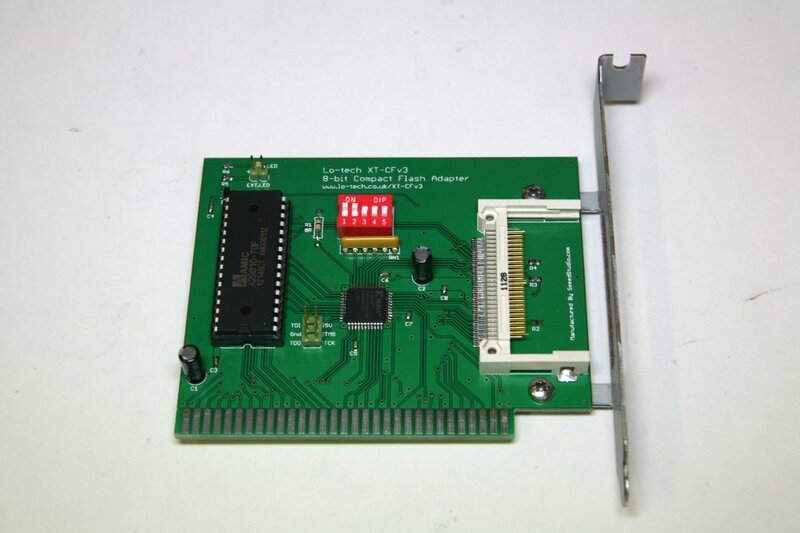 Hi, have your prior cards been tested with Tandy 1000 SL/TL series machines? I’m eagerly looking forward to your V3 card, and I’m hoping it will be available assembled – is there a waiting list that I can subscribe to?